The house was empty and the car was loaded. My parents stood in the driveway – waving and crying. My husband had accepted a job several hours away and I was leaving home for the first time. Did I mention I had just had a baby via c-section two weeks prior? Yeah. The place and position we had been called to turned out to be, well, not all that it had seemed. We found ourselves without a job, without a house, without anyone who cared for us and a really long way from home. We were, in that moment, broken. I still remember my husband and I sitting in the bed late at night. Four children asleep down the hall. There, in the dark, we began to list everything we knew to be true of our God. Not what we could see in that moment because, truth be told, we couldn’t see a whole lot of anything good. 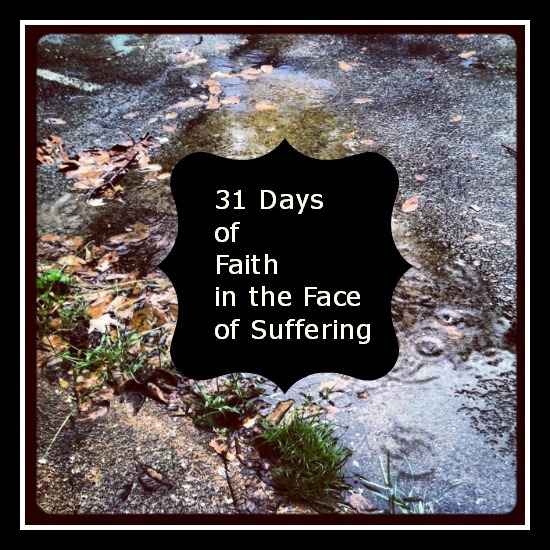 In the face of suffering, faith is taking a step back. It is taking a deep breath. Faith is reminding ourselves of what we know to be true, regardless of the madness circling around us. Knowing God’s Word, His character and His promises are essential in the midst of suffering. We must be in His Word on a daily basis so that, when trials come, those promises are already in our hearts and our minds. A good promise to start with is Psalm 18:30 – seriously, it’s a good one. This God – his way is perfect; the word of the Lord proves true; he is a shield for all those who take refuge in him. His way is perfect. Not always easy. Not always safe. Not always popular. But perfect. His word is true. There are many promises makers, but our God is the great promise keeper. He protects all who run to him for safety. Not some. Not the good ones. Not the worthy ones. All. Satan wants you to stand in the middle of your suffering and be overwhelmed and broken. Instead, step back for a moment. Find a quiet spot and ask God to bring to your mind everything you know to be true of Him. Faith is stinkin’ hard. I’m so glad I have a Father who understands how un-childlike I can be at times! Powerful! Thanks for these amazing words of truth and encouragement, Stacy. Truly needed this today. This month is National SIDS Awareness Month, with the 15th being National Infant Loss Day. It begins a stretch of difficult times from December (Mia’s birth) to March (her passing). There are a lot of times that it’s difficult to “see the forest through the trees”, but you remind me that He’s there no matter the circumstance. And when you can do nothing else but sit in bed and wonder what happened, you can ALWAYS reach out to Him. He knows where you are and will reach into the low places for you. Great post…thank you. YES! Satan would love nothing more than for us to remain steadfast in our brokenness, naming ourselves unworthy, unable to be used by our Father. Great post Stacy! You say it so well, Amber. The enemy certainly wants us stuck and scared and shamed. I don’t think I like him very much. 🙂 Blessings to you!